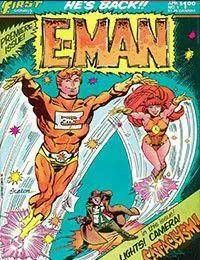 E-Mans first issue for First Comics. E-man and Nova Cane face several villains who are trying to dispose of them all at once and E-Man gets offered to be an actor by an untrustworthy agent. It all converges into a mixed up mashed up adventure.